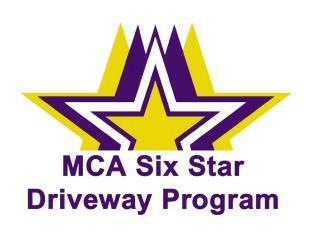 WE ARE AN AUTHORIZED CONTRACTOR FOR THE SIX STAR DRIVEWAY WARRANTY PROGRAM SPONSORED BY THE MICHIGAN CONCRETE ASSOCIATION. You have the right to expect a durable, attractive concrete driveway. By purchasing a MCA Six Star Driveway, you can avoid any problems that could diminish the value and appearance of your home. This warranty is optional. ALL WORK PREFORMED BY HANNEMAN & FINEIS CONCRETE CONSTRUCTION IS BACKED BY A STANDARD ONE YEAR WARRANTY.